The McKnight Artist Residency for Ceramic Artists program, in its 21st year at NCC, intends to recognize and support ceramic artists whose work demonstrates exceptional artistic merit, who have already proven their abilities, and are at a career stage that is beyond emerging. The program is intended to provide these ceramic artists with an opportunity to be in residence for three months at Northern Clay Center, where they can develop their own work and, at the same time, exchange ideas and knowledge with Minnesota ceramic artists. Up to three, 3-month residencies will be awarded in 2018, to take place during the 2019 calendar year, through a competitive application process. NCC will invite one or two other artists through a nominative process. Each resident artist will receive a $6,000 award (for a three-month residency), studio space provided at no cost, and a glaze and firing allowance. During the residency, each artist will present a public lecture/workshop, for which he or she will receive an additional honorarium. At the culmination of the grant period, recipients will be featured in a catalogue and group exhibition at Northern Clay Center. The exhibition will travel to 3 – 5 sites around the state of Minnesota. Recipients are also required to submit a final report at the end of the grant period. This program is made possible by the generous support of The McKnight Foundation, Minneapolis, MN. You cannot be a resident of Minnesota. You must be a ceramic artist. Your work may be either functional or sculptural in nature. Your work may incorporate other materials, but must be primarily ceramic. You must have completed all formal academic training and may not be enrolled either full- or part-time in a degree granting institution by the application deadline. Applicants are NOT required to have a degree. You must provide evidence of your professional achievements over a period of at least five years, through inclusion in major regional or national museum or gallery exhibitions, or juried or invitational craft shows, or receipt of other awards, grants, or fellowships. Your work must demonstrate a sustained level of accomplishment, commitment, and excellence. You may apply to only one of the organizations per year offering fellowship grants that are supported by McKnight funds. In addition, no artist may receive more than $50,000 in McKnight support in any three-year period. Northern Clay Center staff and board are not eligible, as well as immediate family members of Northern Clay Center staff. Staff and board of The McKnight Foundation are not eligible, as well as immediate family members of foundation arts program staff. The deadline to apply for the 2018 McKnight Artist Fellowships and Residencies for Ceramic Artists program is Friday, May 25, 2018 by 5 pm CST (this is NOT a postmark deadline). The online system will not accept any applications beyond 5 pm CST, nor will incomplete applications be accepted. All applications must be received via our online form, however a copy of the eligibility requirements and application check list can be downloaded here. Applications will be reviewed by a three-member panel, which will select recipients on the basis of perceived artistic excellence and demonstrated professional achievement. Applicants will be notified of the outcome of the selection process in late June of 2018. For more information, contact Jill Foote-Hutton at jillfootehutton@northernclaycenter.org or 612.339.8007 x314. Residency Proposal, Budget, and Outcome (maximum of 3 pages, formatted as a PDF). Please include a detailed description of your goals or projects for the proposed residency and budget for any necessary supplies or equipment. See sample applications for examples of budgets. In addition, describe the anticipated outcome or impact of the McKnight Residency and exhibition on your professional development. 10 digital images. Please do not display your name on the image. Images will be projected on the wall and viewed one at a time. Image files should be labeled with last name, first initial, and numbers indicating your preferred viewing order (example: doej1.jpg). Do not include any other information in the filename. Digital images must be saved as JPGs at 96 pixels per inch (ppi) and should not measure greater than 1024 pixels along the image’s longest dimension. For additional information regarding image size and format, please visit our digital image submissions page. Image list for all digital images. The image list must include artist name, titles, date of work, dimensions of work, medium, and image orientation, and should be formatted as a PDF. A current resume (maximum of five pages formatted as a pdf), with your name at the top of each page. An artist statement (maximum of two pages formatted as a pdf), with your name at the top of each page. Please review our tips for using our online forms, and review other FAQs here. 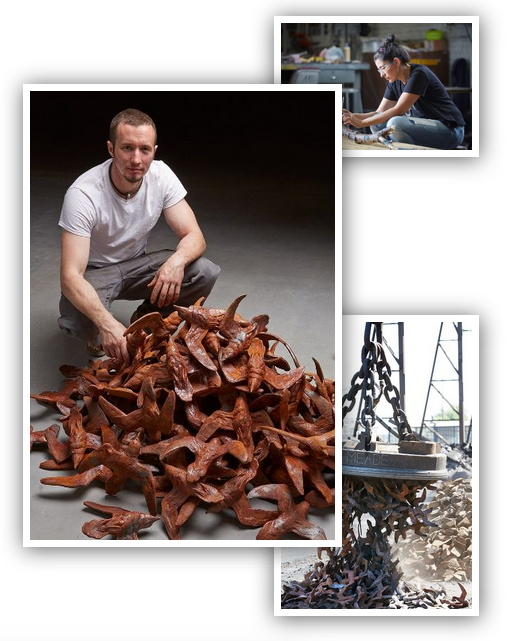 Artists working in any discipline may apply for the Arts Center’s Arts/Industry 2019 program, which takes place at and is funded by Kohler Co. in Kohler, Wis. Each year, 16–22 artists are accepted for 2- to 6-month residencies in the Pottery or Foundry/Enamel areas of the factory. Artists-in-residence receive 24-hour access to studio space, materials, use of equipment, technical assistance, photographic services, housing, and round-trip transportation. The application deadline for 2019 residencies is May 31, 2018. For more information and application form, visit https://www.jmkac.org/explore-discover/arts-industry-program/applications or email artsindustry@jmkac.org. Access to Harvard University Library and Museums with provided ID. in terms of: title, year, size of work, medium/techniques used. May 9, 2016 – Notification will be made via email. May 30, 2016 – Selected artist must accept or decline the residency. more information, contact Kathy King, Director of Education at kking@fas or Shawn Panepinto, Director of Studio Operations and Outreach at panepint@fas or call 617-495-8680.